I love easy party food. My husband and I often entertain with no notice and it’s great to have a few recipes that are perfect party food, but that can be put together quickly. 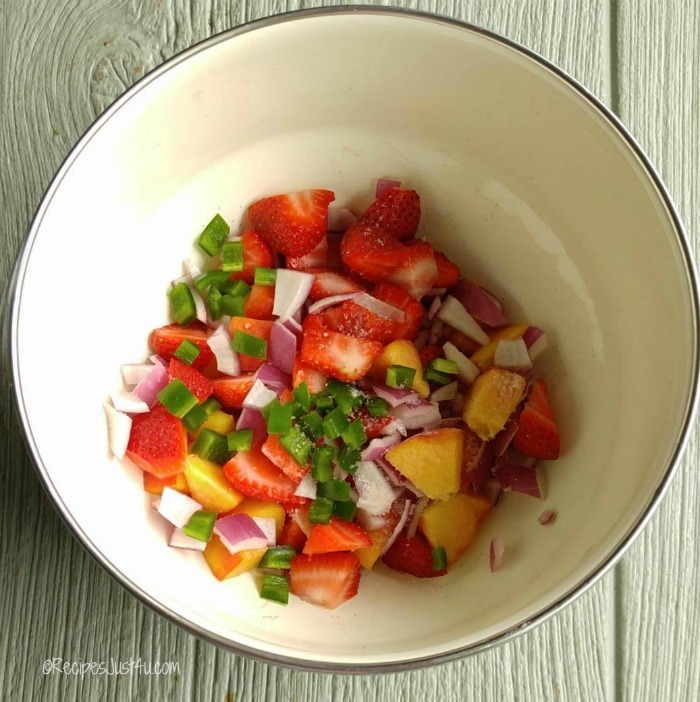 This Strawberry peach jalapeño salsa makes great easy appetizers. I love to serve it with home made tortilla chips. 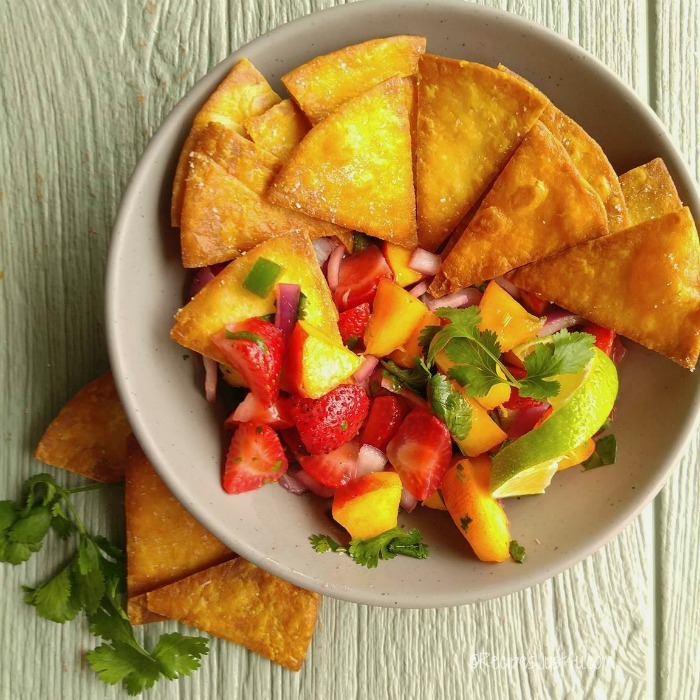 Start your next party with this Strawberry Peach Jalapeño Salsa and my home made tortilla chips. If you like 30 minute meals and appetizers, this recipe is for you. It’s quick and easy and so, so tasty. 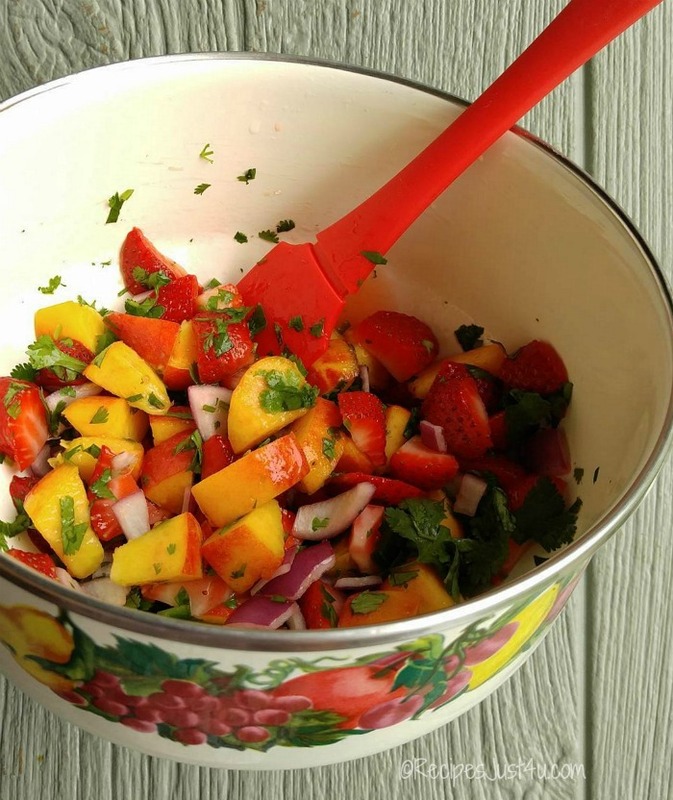 This salsa is chock full of summer time freshness. 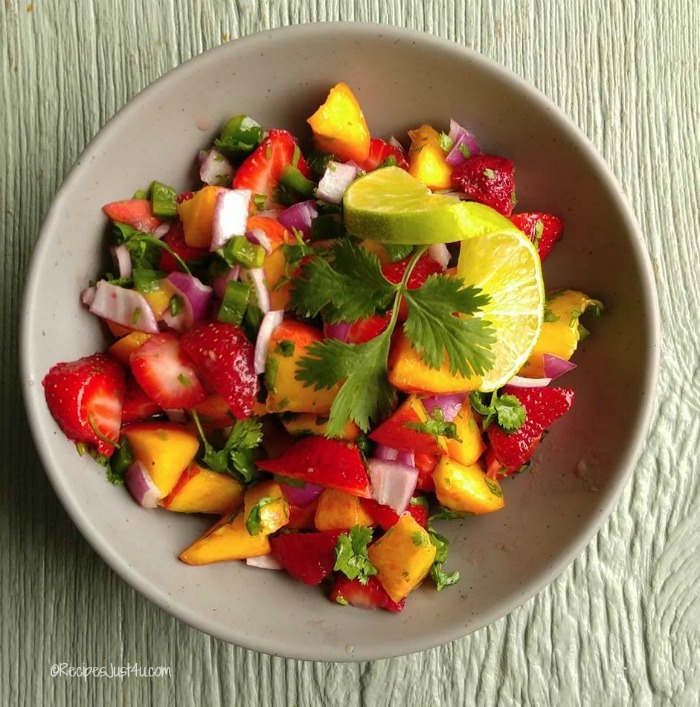 It is a mixture of red onion, jalapeño peppers, cilantro, lime juice, peaches, strawberries, and sea salt. Just look at all this color. It tastes as good as it looks, too! 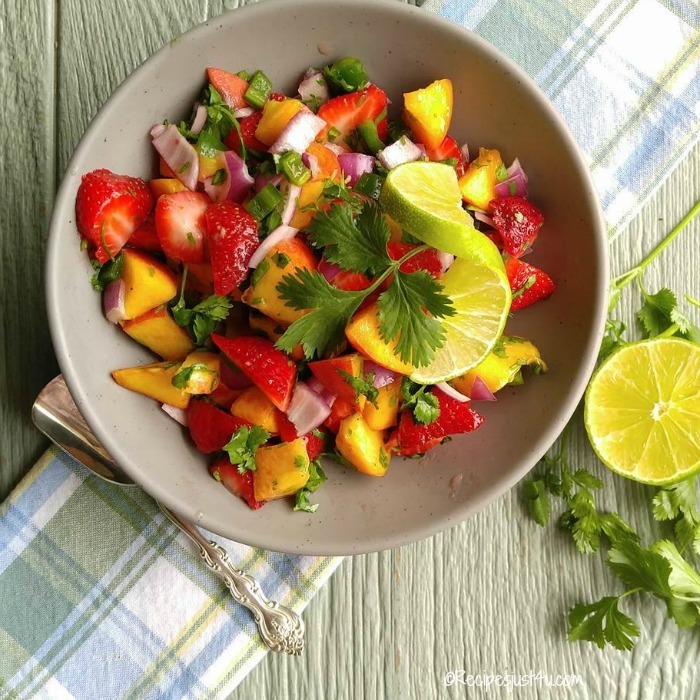 Start by dicing your onion, pepper, peaches and strawberries. I like a chunky texture to my salsa, so I cut mine in medium sized pieces. Give it all a swirl and then mix in the lime juice, chopped cilantro and Pink sea salt.. Believe it or not, the salsa is done! How easy is that? I put it in the fridge so that the flavors will combine well while I made the home made tortilla chips. The salsa needs to chill for at least 20 minutes (it’s even better the next day!) While it is chilling, cut some flour tortillas into triangles. 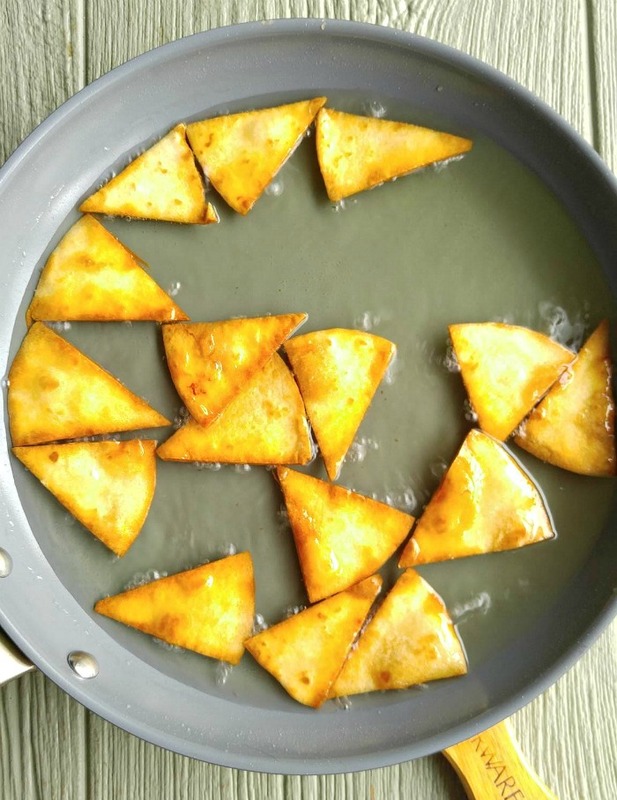 I fried my triangles in canola oil for a few minutes for this recipe, but they can also be baked for about 15 minutes at 350º. Canola oil is a nice clean oil and allows the flavor of the tortillas to shine thorugh. A quick flip in the oil is really all they need. You can tell when they are done by the color of the chips. Don’t crowd the pan. I did mine in batches and they cooked beautifully. Remove to some paper towels to drain the fat and season with some pink sea salt. These are SO much tastier than bagged tortilla chips and so easy to make! Bring out the chilled salsa. Garnish with cilantro sprigs and slices of lime. I LOVE the taste of this mixture. It is both sweet and tangy and just full of the taste of summer! 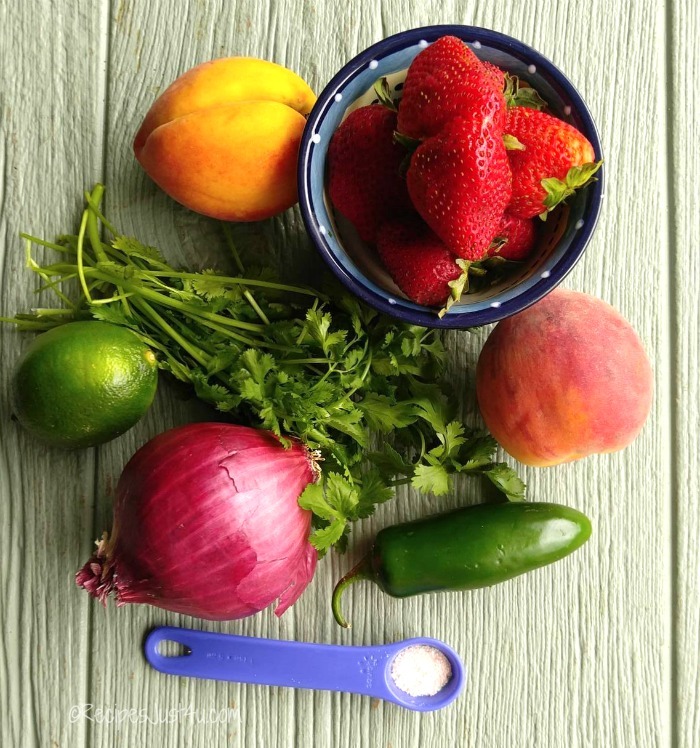 Serve the chilled Strawberry peach jalapeño salsa with the home made tortilla chips. This combination will be the hit of your party! This salsa makes the perfect appetizer but can also be used in so many ways. I love to spoon it over fish or other proteins. See it here with grilled pork tenderloin. What a great combination! Enjoy!! What is your favorite party appetizer when you are in a rush to entertain? Tell us about it in the comments below. 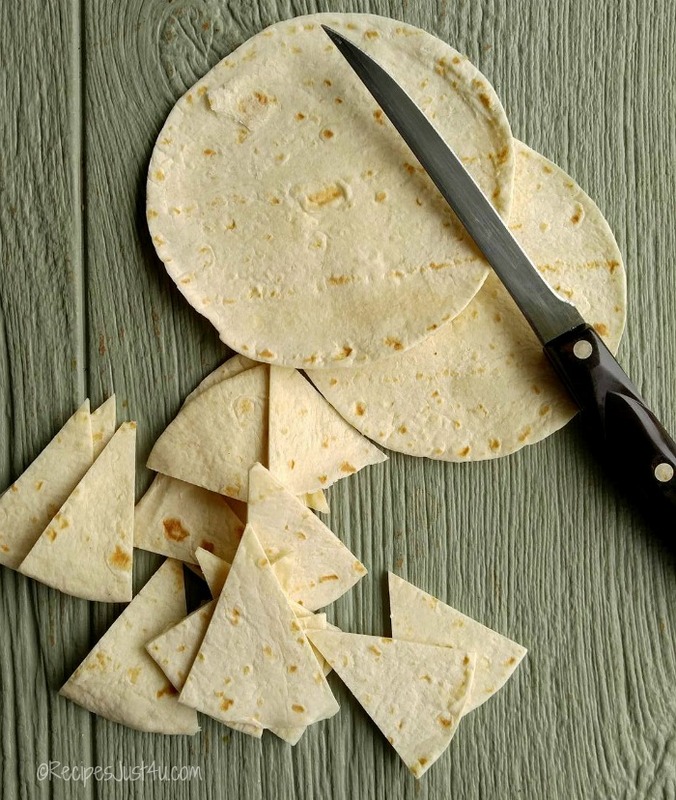 Cut the flour tortillas into triangles. Heat canola oil in a deep frying pan. Drop in the tortilla triangles. Cook about 10 seconds and flip over. Remove to some paper towels to drain. Season with pink sea salt and serve with the chilled salsa. 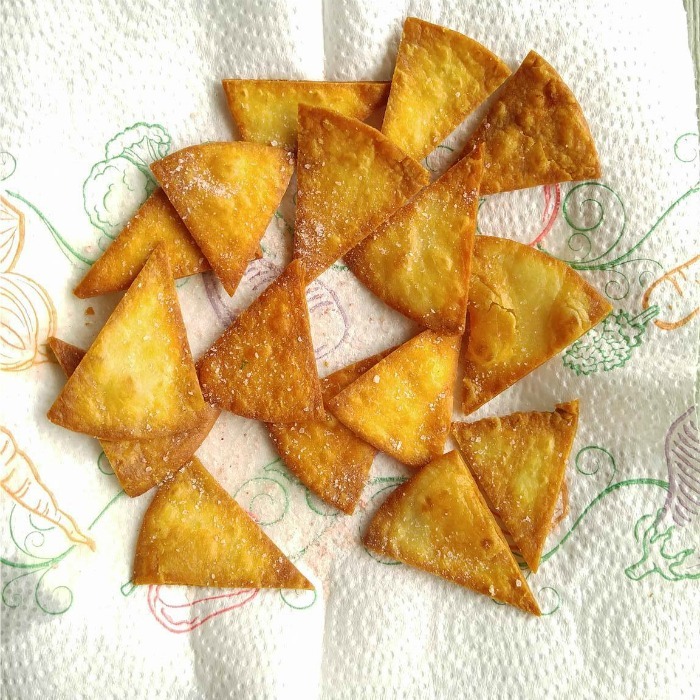 The tortilla chips can also be baked for abouit 10-15 minujtes at 350º, turning once during baking. We really liked it. It has a sweet and tangy flavor. Oh my goodness, that looks mouthwateringly good! I need to make that salsa ASAP!